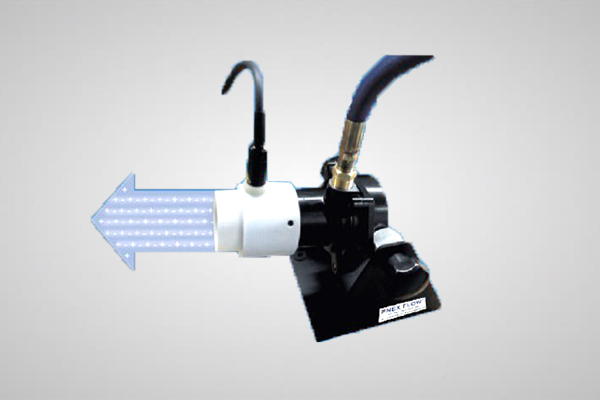 The Nex Flow™ Ion Blaster Beam™ neutralizes static electricity and can remove static charge on a statically charged part and blow off dust up to 15 feet (4.6 m) away with no moving parts. Its compact design allows it to be used in hard to reach areas or confined spaces. The air volume and velocity are infinitely adjustable over a wide range using a pressure regulator to address any application from light to heavy duty. The Ion Blaster Beam™ makes use of an “air amplifier” (Model AM40) mounted on a sturdy metal stand to be able to mount the unit and aim it in the desired direction. On the head of the air amplifier is a plastic attachment with an Ion Point. The amplified airflow passes by the Ion Point, ionizing the air. The plastic attachment is used as metal will tend to draw away some of the ionization weakening the overall effect of static elimination. This maximized, ionized airflow with large entrained volume uses only a minimal amount of compressed air while providing a long, laminar cone of ionized air that will eliminate static charge on the target part. 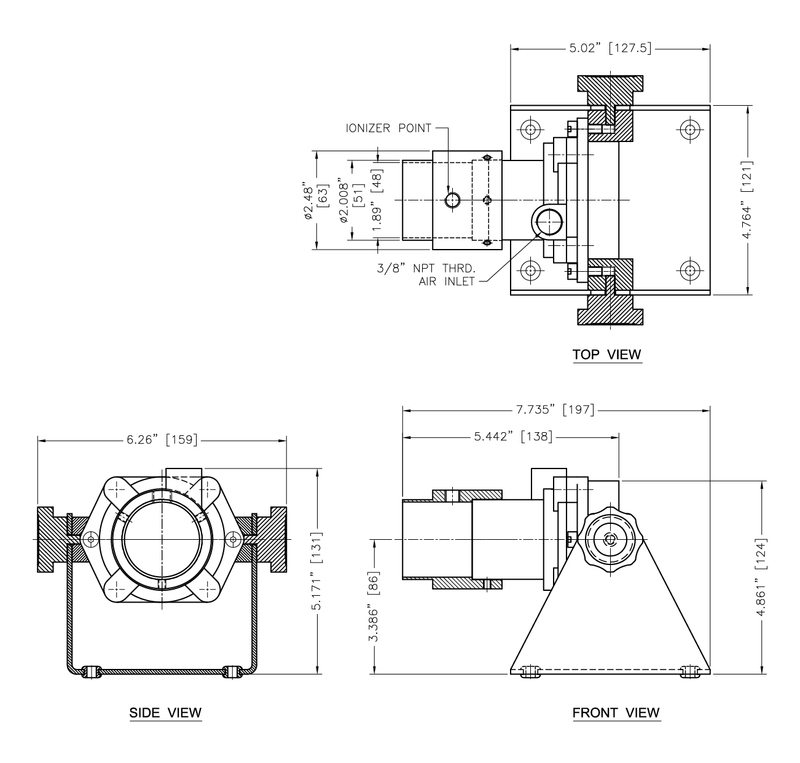 In most applications only 10 psig (0.7 bar) is required to operate effectively. The Ionizing Point is a powerful ionizer which remains effective because the air exit “plastic PET head” of the unit prevents weakening if ions which metal attachments may do. This makes the Ion Blaster Beam™ far more effective than systems using metal. The Ion Blaster Beam™ has a wide range of applications where a static bar with an air knife or other air support cannot be used. An example is blowing ionized air into a cavity such as a plastic container to neutralize it faster and easier, and to loosen dirt and dust stocking due to a static charge. It is important that the compressed air supply be clean and to have a filter upstream and an automatic drain to remove unwanted moisture. If there is a possibility of oil in the air lines, an oil removal filter with an automatic drain is also recommended. And of course, a regulator to set the line pressure to the lowest level required will minimize compressed air cost. The unit is rugged, compact, easily mountable, quiet, and uses very little compressed air. It is shockless and safe to use. Neutralization of static charge inside containers. Certification: North American Power Supplies certified to UL and CSA standards and Spot Ionizer used with the Ion Blaster beam is included with the certification. European Power Supplies CE approved and Spot Ionizer used with the Ion Blaster Beam is included with the certification. Stainless steel emitters on the ionizer. Electrical: For use with 7 kV rms, 5 milliamperes (max) power supply which will last much longer than 5 kv power supplies. 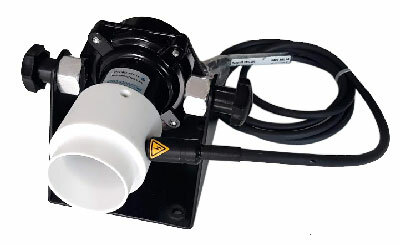 Maximum Ambient Temperature: 122 degrees F or 50 degrees C.
Ion Blaster Beam™ power supplies are available in various models including a unit that will monitor the static bars for effectiveness.